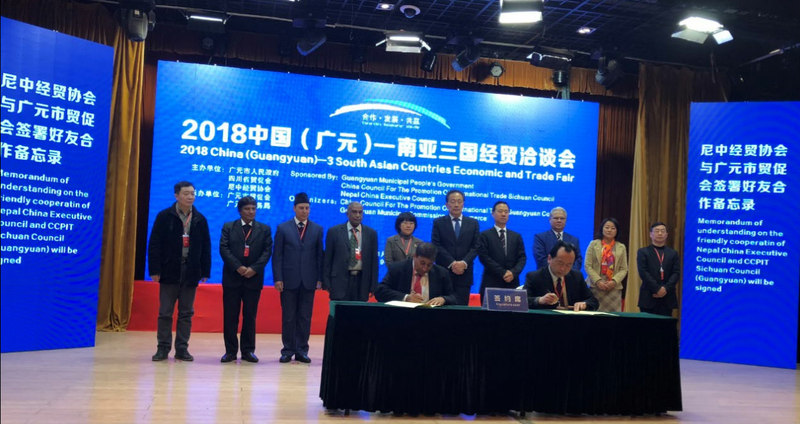 On January 9th, 2018, China (Guangyuan) —3 South Asian Countries Economic and Trade Fair was held in Guangyuan. This Fair was co-held by China Council for the Promotion of International Trade Sichuan Council (CCPIT Sichuan Council for short), Guangyuan Municipal People’s Government, and Nepal-China Ｅxecutives Council and organized by China Council for the Promotion of International Trade Guangyuan Council (CCPIT Guangyuan Council for short) and Guangyuan Municipal Bureau of Commerce. President Li Gang of CCPIT Sichuan Council attended the conference and delivered a speech. President Li Gang said in his speech that, CCPIT Sichuan Council had always been committed to strengthening the economic exchange and cooperation with South Asian countries and had held South Asia-Sichuan Business Promotion Roundtable Conference for eight years in a row, which laid a solid work foundation for both Sichuan companies and South Asian enterprises. Later, he proposed the following two suggestions on deepening the cooperation between Sichuan and South Asia. Firstly, focus on major fields and strengthen cooperation. He said that, CCPIT Sichuan Council would actively encourage Sichuan enterprises to more deeply participate in the infrastructure construction, urban construction, agricultural development, and talent exchange of South Asian countries so as to realize advantageous complementarities and mutual benefit. Secondly, promote bilateral investment and cooperation. Sichuan warmly welcomed South Asian entrepreneurs to grasp the development opportunity of Sichuan and expand the investment in Sichuan. He pointed out that, CCPIT Sichuan Council would continue to play the role of bridge in actively promoting the investment and cooperation of bilateral enterprises together with all chambers of commerce and associations of South Asia to co-share the development dividend and co-create a brighter future.